ABSTRACT. We describe the presence of the bivalve Modiolarca lateralis (Say, 1822) in six tropical ascidians Ascidia curvata, A. sydneiensis, A. panamensis, A. interrupta, Herdmania pallida and Polycarpa spongiabilis collected at depths of 1-3 m on coral reefs, mangrove roots and dock supports in Almirante Bay, Bocas del Toro, Panama (9°18'N, 82°13'W) during June-July 2011. Bivalve prevalence varied between 9-30% across species, but was mainly associated with A. panamensis, P. spongiabilis and A. interrupta. Prevalence seems to be influenced by tunic thickness rather than by the ascidian size. Bivalves varied in size (0.6-11 mm shell length), with the smallest individual found in A. sydneiensis. There were only one or two bivalves per ascidians, although a maximum of 18 was found in one A. panamensis. M. lateralis seems to behave similarly to its temperate counterparts: it has a variety of hosts, occurs mainly in the anterior region of the ascidians, and has a variable abundance per host. Keywords: bivalve-ascidian relationship, coral reef, mangrove roots, tunic dwellers mytilids, Modiolarca lateralis. RESUMEN. Se describe la presencia del bivalvo Modiolarca lateralis (Say 1822) en seis especies de ascidias tropicales: Ascidia curvata, A. sydneiensis, A. panamensis, A. interrupta, Herdmania pallida y Polycarpa spongiabilis. Las ascidias fueron recolectadas entre 1 y 3 m de profundidad durante junio y julio 2011 en arrecifes de coral, raíces de manglar y pilotes de muelles en bahía Almirante, Bocas del Toro, Panamá (9o18'N, 82o13'W). La prevalencia del bivalvo varió entre 9-30% según la especie, encontrándose asociado en mayor proporción con A. panamensis, P. spongiabilis y A. interrupta. El grado de prevalencia parece ser influenciado por el grosor de la túnica más que por el tamaño de la ascidia. El tamaño del bivalvo varió entre 0,6 y 11,0 mm, detectándose los ejemplar más pequeños en A. sydneiensis. Se contabilizó uno ó dos bivalvos por ascidia, aunque en un individuo de A. panamensis se contabilizaron 18 bivalvos. La relación entre M. lateralis y las ascidias muestra un comportamiento similar a sus contrapartes de zonas templadas: posee una variedad de huéspedes, se establecen en mayor abundancia en la región anterior de la ascidia y poseen una abundancia variable por ascidia. Palabras clave: relación bivalvo-ascidia, arrecifes de coral, raíces manglar, mitílidos minadores de túnica, Modiolarca lateralis. Many invertebrates may find refuge within ascidians, including commensal amphipods (Thiel, 2000), shrimps (Baeza & Díaz-Valdés, 2011) and parasitic copepods (Boxshall, 2005). Cyanobacteria may also be found in the tunic (López-Legentil et al, 2011), along with micro-filamentous algae (Lambert et al, 1996) and invertebrates. Two groups of bivalves are known to live embedded within the ascidians tunic: the verticordiid Mytilimeria nuttallii Conrad, 1837 which is found in colonial ascidians in the eastern Pacific, along the coast of North America (Lambert, 2005), and the mytilid genus Modiolarca Gray, 1843 (= Musculus; Morton & Dinesen, 2011). These include Modiolarca subpicta in the northeastern Atlantic and Mediterranean waters, M. lebourne (White, 1949) in the Indian Ocean and M. lateralis (Say, 1822) in the western Atlantic (Morton & Dinesen, 2011). Shell morphology, anatomy and ontogeny in Modiolarca subpicta were studied in the 1800's and early 1900's (Jeffreys, 1863; Lovén, 1846; List, 1902), and more recently (as M. tumida) with an important and detailed analysis of the life cycle of M. subpicta (Bodger & Allen, 2008) and biology and functional morphology (Roberts & Breen, 1985; Morton & Dinesen, 2011). Modiolarca subpicta is a non-obligatory tunic dweller that may switch ascidians hosts during its life cycle. Reproduction on the North Sea coast of England is usually in the summer when it occurs on Ascidiella scabra (Muller, 1776) as a preferred host. This species usually lives for three years (Bodger & Allen, 2008). In Denmark, the main host is Ascidiella aspersa, and both bivalve and host live for ~18 months and the life cycle of the bivalve is co-ordinated with that of the host (Morton & Dinesen, 2011). Surprisingly, very few studies examined the relationship of M. lateralis and its tropical ascidians hosts. Along the coasts of the southeastern USA, it has been recorded in the tests of Molgula occidentalis (Trausted, 1883) and Styela plicata (Lesueur, 1823), or attached to hard substrates (Bertrand, 1971). In Venezuela, it was the dominant species of bivalve associated with mangrove roots, but their ascidians hosts were not identified (Cedeño et al., 2010). More than 70% of Molgula had between 1-48 bivalves in Alligator Harbor, Florida (although a second collection of 65 animals washed up on shore after a storm had no bivalves), while at Turkey Point 100% of Molgula individuals had between 17-77 bivalves. All of the 12 Styela dredged from Alligator Harbor had between 4-30 bivalves, while 100 specimens taken from a float had none (Bertrand, 1971). Due to the paucity of studies examining the relationship of Modiolarca with its hosts, we looked for more possible ascidians' hosts in Bocas del Toro, Panama, a tropical location with high ascidians diversity (Rocha et al., 2005). Ascidians were collected between June and July 2011 from several locations within Almirante Bay, Bocas del Toro, Panama: the Smithsonian Tropical Research Institute dock (STRI) (9°21'03"N, 82°15'26"), Bocas Marina (9°20'08"N, 82°14'50'W), Red Frog Beach Marina (9°20'13"N, 82°10'38"W; docks and mangrove); Solarte Marina (9°18'36"N, 82°11'44"W; docks and mangrove), and Pastores Island (9°13'22"N, 82°20'12"W; coral reef). These places are all in calm protected waters. The species targeted were Ascidia curvata, A. sydneiensis, A. panamensis, A. interrupta, Phallusia nigra, Herdmania pallida and Polycarpa spongiabilis. Up to 20 animals of each species found during approximately one-hour snorkeling in these shallow (less than 3 m) waters were collected. Oceanographic and ecological characteristics of the region can be found in Guzmán et al. (2005). In summary, surface temperature of the seawater varies between 26.2-31oC; salinity is usually 30-34, but can be as low as 20 after heavy rains (Kaufmann & Thompson, 2005). An intensive survey of ascidians was carried out here in August 2003, including coral reefs, mangrove roots and Thallasia testudinum seagrass beds. In that study, 58 species were reported upon. Ascidians in the area were shown to be diverse with >40% of the known Caribbean present (Rocha et al., 2005). Ascidians were observed alive, relaxed with menthol and preserved in formalin 4%. External tunic pH was measured by gently touching pH test paper strips on the humid tunic. The length of each specimen (with tunic) was measured, from the tip of the oral siphon till the posterior margin, and then the animal was weighed after blotting with a paper towel (±0.1 g). The tunic was cut open along the ventral margin and the animal removed. The thickness of the tunic was measured with a rule (±1 mm) along the cut. The inside of the tunic was inspected under a dissecting microscope to look for Modiolarca blisters. When found, the number and position of the bivalves was noted for each ascidia, after which it was removed from the tunic and measured (length and width), using a vernier caliper (±0.1 mm). The length of each bivalve was used in a Pearson correlation with the length of its ascidian host to test if larger bivalves would be found in larger ascidians. To see potential differences between levels of infestation of ascidians tunic with Modiolarca among habitats, the most infested species of ascidians (Ascidia panamensis and Polycarpa spongiabilis) were used to compare the association among three habitats: coral reef, mangrove roots of Rhizophora mangle and dock pilings. Since the sample size was small and only one coral reef was surveyed (no replicates for this habitat), no statistic test was made. All specimens of Modiolarca were deposited in the Museu de Zoologia, Universidade de São Paulo, Brazil (MZSP 104634-104639). A total of 199 ascidians specimens were collected belonging to seven species in both the orders Phlebobranchia (comprising 67% of all the individuals) and Stolidobranchia (the remaining 33% of all individuals). In total, 30 individuals (15%) hosted bivalves. The ascidians A. panamensis and P. spongiabilis were the most common hosts (~66% of ascidians infested). Additionally, some small juvenile bivalves (2-3 mm shell length, N = 4) were collected from the tunic of the colonial Botrylloides sp. (N=3) and one Eudistoma sp. (both not included in Table 1). 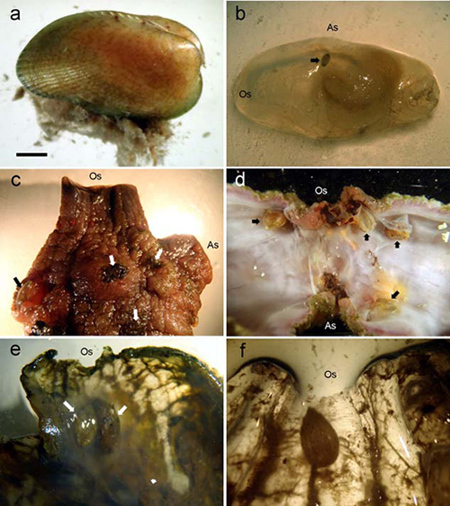 Thus, eight ascidians species are hosts for M. lateralis at Bocas del Toro, Panama (Fig. 1). Table 1. Measurements of the ascidian host and mytilid bivalve (Modiolarca lateralis, ML) in Bocas del Toro, Panama. Figure 1. Modiolarca lateralis and its hosts. a) Modiolarca lateralis, scale bar = 1 mm, b) Ascidia curvata-external view, c) Polycarpa spongiabilis-external view, d) P. spongiabilis-internal view. Tunic elevated to see the shells, e) Ascidia panamensis-internal view, f) Ascidia sydneiensis-internal view. Arrows indicate Modiolarca position in the host. Os: oral siphon, As: atrial siphon. Modiolarca lateralis does not appear to select for body size of their ascidians hosts, whose length varied between 2-12 cm. Similarly, the length of the bivalves and ascidians were uncorrelated (Pearson correlation, r = 0.22, P = 0.09). Our sample tended to include mostly adult ascidians that are more easily found in the field, and so selection was possible but not identifiable due to sampling procedures. Both species with thinner tunics, A. curvata and A. sydneiensis (1 to 2 mm, Table 1), also had the lowest bivalve prevalence, suggesting that tunic thickness may have a role in the relationship (Table 1). The pH of the tunic of ascidians with bivalves ranged between 3.5-6.0, and none was found in P. nigra with a pH 2 (Table 1). Overall, 15% of the ascidians hosted at least one bivalve and prevalence ranged from 9-30% according to species (Table 1). Herdmania pallida had the lowest numbers, while the highest was recorded from A. panamensis. Shell length of M. lateralis ranged from 0.6-11.1 mm, while most were 6-8 mm. Our results indicate that the prevalence in Caribbean waters (max 30%) is lower than that found in Florida, where M. lateralis could reach 100% both in Molgula occidentalis and Styela plicata (Bertrand, 1971). It is also lower than the numbers observed in the North Sea for M. subpicta: 42-96% of specimens of Ascidiella scabra and 44-86% of Polycarpa pomaria (Bodger & Allen, 2008). The bivalve M. lateralis was more prevalent in two ascidian species, one in the family Ascidiidae and one in Styelidae, similar to M. subpicta from British waters where it was most often found in Ascidiella (Ascidiidae) and Polycarpa (Styelidae) (Bodger & Allen, 2008). This study was done during a Tunicate Biology workshop held in Bocas del Toro Research Station when many animals of a variety of species were dissected for two weeks. The only common species which presented M. lateralis were the ones in this study. Phallusia nigra was included because of the tunic consistency and phylogenetic similarity with other ascidiids that hosted bivalves. The only other two species with the bivalve were one botrylid and one Eudistoma colonies. Although M. lateralis present a range of hosts, it seems that not all ascidian species are adequate as a host. Molgula occidentalis occurs in the region but in very low abundance and it was not found during this survey. Host aggregation may play a role in the dispersal of the bivalves and encounters rates with hosts because of low dispersal abilities of eggs and larvae in this group (Merril & Turner, 1963). In Bocas del Toro, A. curvata and A. sydneiensis occur in large aggregations, but they also have thin tunics that are not ideal for the bivalve. The habitats of mangrove roots and dock pilings more commonly had aggregations of ascidians, which may explain the larger prevalence of M. lateralis as compared to coral reefs, where ascidians are less common (Table 2). In Florida, ascidians that were aggregated in clumps of 212 animals were much more "infested" by bivalves than ascidians found alone (Bertrand, 1971). Table 2. Counts of Modiolarca lateralis in two Caribbean ascidians, in three types of habitats, in Bocas del Toro, Panama. However, in contrast to the observations of the present study, juveniles of M. subpicta occurred around the exhalant siphon of A. aspersa (Morton & Dinesen, 2011). We also observed M. lateralis close to the atrial siphon, but only in larger ascidians. The bivalves apparently do not benefit from the water current created by the host, because adults are usually not close to the incurrent or excurrent flow and because they are in very different positions in the host (Fig. 1). Another observation is that bivalves thrive mainly in ascidians with thick tunics (>2 mm, Table 1). Bivalves were smallest and in low numbers in Ascidia sydneiensis which has one of the thinnest tunics in our sample, suggesting that M. lateralis leave this host upon reaching a certain size (ontogenetic change of host) or simply stop growing and/or die due to the lack of suitable habitat. Although the bivalve exhibits a sedentary life, aquarium observations by Roberts & Breen (1985) proved the temperate species M. subpicta to be rather mobile and able to "emerge from their pockets in the host's test and crawl about quite actively". Thus, change of position in the host or even change of hosts are possible for these mytilids and it would be interesting to make a behavior study of M. lateralis to compare it with its temperate counterpart. Also, a study of the longevity of both hosts and the bivalve are necessary to understand how coupled are their life cycles and to test if growth rates are proportional and if the identity of the host influences mortality of the bivalve. The low pH of ascidians' tunic seems to be a chemical strategy against predation and many species present very low surface pH values. The acidic tunic of P. nigra seems also to prevent bivalve settling, probably due to shell dissolution (Gazeau et al., 2007; Waldbusser et al., 2011) and could be the cause of the absence of M. lateralis from this species. Additional study will be required to answer the following questions: (1) How does M. lateralis disperse and find new hosts? (2) What, if any, association exists between juvenile ascidians and settling bivalve larvae? and (3) Is this relationship truly commensal, or does either the ascidians or the bivalve benefit from the association? Juan I. Cañete thanks to Prof. Dr. Carlos S. Gallardo (UACH, Chile) for the recommendation letter and National Science Foundation (NSF) for the fellowship to participate in the PASI-Advanced studies on Biology of Ascidians carried-out in June 2011 at Smithsonian Tropical Research Institute (STRI) at Bocas del Toro, Panama. Our special thanks to Dr. Rachel Collin (STRI) for providing logistics at Bocas Research Station, to Dr. Brian Morton (Natural History Museum, London, England) and J.A. Allen (University Marine Biological Station, Millport, Scotland) for providing us with recent papers on Modiolarca subpicta. Thanks to James J. Roper for reviewing the English, Martin Thiel and two anonymous reviewers for suggestions which improved the manuscript. JIC thanks the Research & Postgraduate Agency of University of Magallanes (Grant PR-F2-01CNR-10) for financial support and RMR thanks CNPq for a research grant (304768/20103).